Yes, I'm a gear head, especially when it concerns clothing. I'm always on the lookout for very wearable, practical, yet stylish clothing that packs well, dries quickly and is eco-friendly on top of it. I just found such a clothing manufacturer, Nau, when I was browsing recently in REI in New York City. Nau's high-tech, performance-based products are minimalist, light and fashionable. That's a lot to expect from a dress that I tested out, the Chrysalis, aptly named considering it transforms from a light, water-repellent, mid-thigh-length shell (that I wore as a long-sleeve dress in cool weather atop a black SmartWool sweater and black leggings) to a sleeveless dress with a hoodie. The Chrysalis is feather light and, though it looks quite simple, when I wore it all over New York City, it elicited comments from fashion-conscious and fellow gear heads alike. The craftsmanship is apparent as is the appealing silhouette. No matter if it was a breezy, chilly, rainy or sun-filled day (or all of these weather conditions in a single day as Spring in New York City tends to be quite fickle), the Chrysalis was oh-so-comfortable and adaptable. 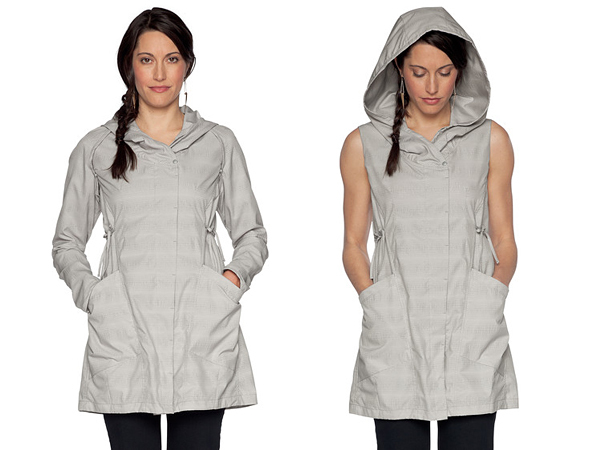 This dress is made of 100% recycled polyester with an added water repellent finish. It's got two cute ties on the waist that you can cinch, as well as two deep front pockets, and a flattering back pleat. Plus, the hoodie converts to a lovely shawl collar. The construction easily allows the Chrysalis to go from day to night, from the bike path to the bar. One day, I sat down to a meeting with a colleague who brought along her toddler. Within moments, her three-year-old proceeded to spill an entire glass of chocolate milk on my Chrysalis. I was unfazed, as I watched the milk bead up and blotted up the remaining liquid with a paper towel, leaving the Chrysalis fresh and unstained. On top of all this, Nau's eco-credentials are coherent with my sensibilities: the company has a respect for nature, is a proponent of bicycle advocacy and hugs trees as much as I do. The organizations they've partnered with include Mercy Corps that delivers relief to communities affected by disaster or civil unrest; Ashoka that brings together investors, entrepreneurs and governments to initiate social change; and The Bikes Belong Foundation that has the goal of making the U.S. are more bike-friendly country. I'm off to Portugal and Luxembourg this week and I'm wearing the Nau Chrysalis on the plane. Since I don't check luggage and I need clothing items that does double or triple duty, this will be my new favorite piece. What a great find! Love the design and I'm always looking for ways to travel light! That is so cool! I love that the sleeves are detachable. It's so convenient -- plus it looks smart and stylish. Hi Irene, You should check out the Nau website. I covet a lot of their other cute items that all revolve around being light, practical, well constructed and stylish. Hi Jane, I'm very big on clothing that does double and triple duty. So the removable sleeves were a real plus for me. How clever! Maybe this line of clothing will help me with my overpacking problem the next time I travel. What a cool dress. The fact that the sleeves are detachable is a great bonus. I like this versatile dress. Hi Cheryl, When I first saw it, I loved it before I even knew about the detachable sleeves. Hi Donna, Yes, I'm all about versatility. Certainly helps when you want to pack light. I have never seen anything like this dress. How versatile! Genius! Honestly, we could use more outfits like this for everyday life, not just traveling! Thanks for these smart recommendations. I'm traveling this summer and would rather die than check my luggage. This is a cool dress--and so functional too. I assume it doesn't get wrinkly then? What kind of prices do you find on this kind of item? Hi MyKidsEatSquid, No, it doesn't wrinkle. I had it all rolled up on the plane and then pulled it out and it looked great. But versatility and performance doesn't come cheap. It's over $200. Hi Ruth, I'm always so surprised why almost everyone I know thinks checking luggage is perfectly acceptable. Hi merr, I agree. I love pieces of clothing that transform into other items. I found a product in Finland that can become a dozen things. And I'm now traveling with a dress that becomes several other pieces of clothing. I don't usually love polyester, but that chocolate milk story certainly sells the product! Hi Kris, It really came in handy yesterday in Luxembourg when I wore it to go museum hopping and then ended up walking a nature trail. It started drizzling and I did not have to worry about getting soaked. Then it dried by the time I got to lunch after the walk when I dined at an upscale restaurant. Wonderful design and so stylish look. I am sure it is comfortable and definitely ideal for traveling! Hi Rental, I wore this as a dress (long- and short-sleeve), a rain coat and a windbreaker for the past 2 weeks when I was traveling in Portugal and Luxembourg. It looked great during the day when I was racing around town and at night when I had to meet clients for cocktails. And it performed well with the ever-changing weather conditions I experienced. Hi chalet a louer, Glad you've been enjoying my posts.